Good to hear you’re going to participate in the Ajax Camp on ‘De Toekomst’ next summer. Have you ever participated at an Ajax Camp before and how do you know the Ajax Camps? This is the first time I`m going to participate at the Ajax Camp. Last year I went to the FCB Escola Camp and over there a parent advised us to go to the Ajax Camps, because this should be the best soccer camp in Europe. With who do you come to the Ajax Camp? I`m going to participate together with my friend Beckham and my father will travel with us. Have you ever visited the Netherlands before and how long do you stay? I have never visited the Netherlands before, so this summer will be my first time. We will stay about 8/9 days and then we will visit Antwerpen in Belgium. At which club do you play football in Australia and how often a week? 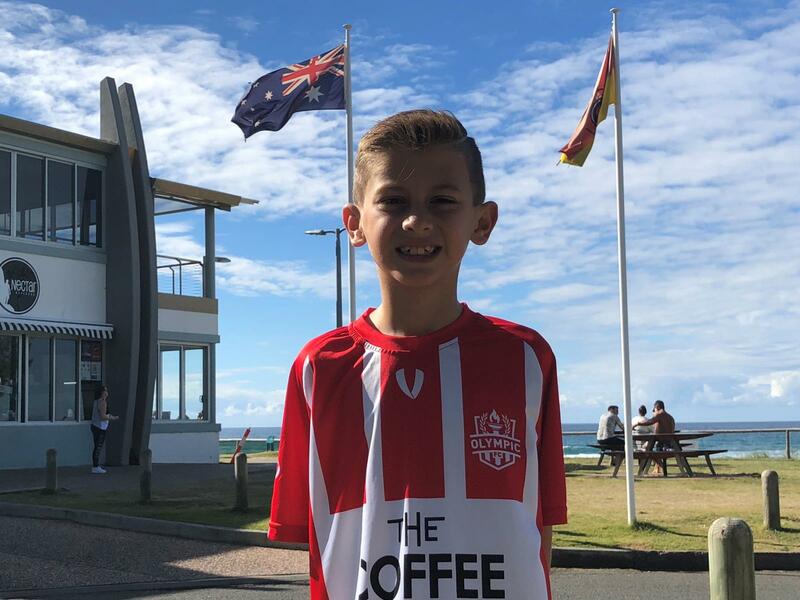 I play for Olympic FC which is in Brisbane and play U10’s SAP level which is the highest level you can play at that age in Australia. We train 3 times a week and play the competition matches on Sunday. I also play soccer several times a week with my friends at school. Do you see a lot of games of Ajax and do you have a favorite soccer player? In Australia the matches are not broadcasted live only the Premier League and Champions League. I follow Ajax on Social Media and YouTube and saw the final against Manchester United last year, but unfortunately they lost the game. My favorite player that played for Ajax is Dennis Bergkamp and I saw him on YouTube when he scored against Newcastle United with that amazing flick and spin around an defender. Currently the World Cup is on. Which country do you support? Of course I supported my country Australia, but they’re knocked out if the group phase. Now I hope Spain with my favorite player Andrés Iniesta is going to win the World Cup, but it will be very difficult with Germany, France and Brazil. What is a special moment when you think about the World Cup? The goal of Tim Cahill against the Netherlands on the World Cup 2014. I have seen this goal a lot the last years. What is the most spectacular game you’ve ever played? My favorite moment was scoring the winner in the final of the Johnny Warren Cup U8’s with 30 seconds left in extra time. We were 3-0 down at half time and we made it 3-3 with 10 seconds left in second half normal time to take it to extra time. I received a headed pass from my team mate, controlled it with my right foot to go one on one with the last defender, I faked the shot and cut it back to my left and went past him to score with my left foot through the GK’s legs. It has been a very nice day for me.